We've been doing this for a few years now and it nevers fails to impact on us how much our little shoe box of gifts means to the children who receive them. For many it is the first ever Christmas present they have received, for most it is the only one they will receive. The children's faces just light up as they delve into their boxes and see what treasures they have received. There are restrictions on what you can include so pick up a leaflet which will tell you what to do. Then choosing the contents of your box can be good fun making sure you write on the label if your box is for a boy or girl and which age group. 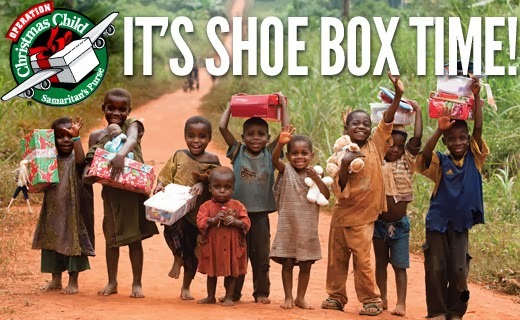 On Sunday 8th December at both the Chesterfield and Alfretom meetings we will collect in the boxes and have a great time together looking at the work of Operation Christmas Child run by the charity Samaritan's Purse.